This piece is based on remarks I made to the 117th Diocesan Convention of the Episcopal Diocese of Western Massachusetts, asking delegates to pass a resolution entitled “Creation Care in Our Congregations: Living Lightly on God’s Good Earth.” The resolution was created in response to the 79th General Convention, which affirmed the Episcopal Church’s intention, “in the spirit of the Paris Climate Accord,” to make “intentional decisions about living lightly and gently on God’s good earth.” Among other things, the resolution calls on all parishes in the diocese to create a Green Team and to undertake an energy audit. To download the resolution, click here. 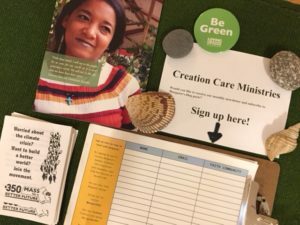 I am grateful that the Episcopal Church has named Creation Care as one of the three centerpieces of its attention for the next several years. You are probably aware of the report issued a few weeks ago by the U.N.’s Intergovernmental Panel on Climate Change. The IPCC report made it clear that planetary warming is well underway, that it is taking place more rapidly and with more extreme effects than scientific models predicted, and that time is running out to avert climate catastrophe. To stabilize climate change at a 1.5 degree Celsius rise above average global temperatures in pre-industrial times, society worldwide will have to undergo a radical transformation. The IPCC notes that the scale of change that is required to cap global warming at 1.5 degrees is historically unprecedented: never before in human history has our species changed its way of living that dramatically and that fast. What I want to say is that this is the moment for which the Church was born. We were made for this challenge. • Because we put our faith and trust in the Holy Spirit, who renews the face of the earth (Psalm 104:31). I was touched by Bishop Doug Fisher’s convention address, especially his reflection on the power of turning from an old way of living to something new. He mentioned that St. Paul uses the phrase “but now” twenty-seven times in his Letters, as in: “For once you were in darkness, but now in the Lord you are light” (Ephesians 5:8). Once you were in darkness, but now you are light. Once you were dead, but now you are alive. Once you were far from God, but now you are near. 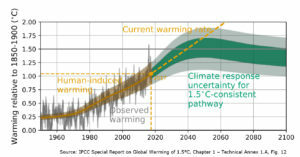 The IPCC report tells us that as a global community, we have only 10 or 12 years in which to make that turn. We want to give our children and our children’s children a habitable world. So let’s make a start. I move that we pass this resolution. I am glad and grateful that our diocesan convention voted to pass the resolution. I look forward to seeing how we will move ahead quickly in the months ahead to honor the God who is making all things new (Revelation 21:5). This post is based on a statement I read yesterday morning (October 25, 2014) at the annual convention of the Episcopal Diocese of Western Massachusetts. 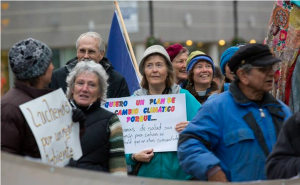 That afternoon the diocese passed a resolution asking the Episcopal Church to divest from the top 200 fossil fuel companies and to re-invest in clean energy. The resolution, which passed by an overwhelming majority, is included at the bottom of this piece. I have been serving as the diocese’s Missioner for Creation Care since last January, and I can’t imagine a more rewarding or meaningful way to spend my time. I am especially grateful for the advice and support of our bishop, Doug Fisher, whose understanding of Jesus’ mission inspires me and gives me strength. Thank you, Doug. I compare my ministry to a swinging door. Sometimes I turn toward the Church, and sometimes I turn toward the secular world. When I turn toward the Church, I speak about the sacredness of creation and about God’s call to protect the web of life. Most of us aren’t aware that the web of life is unraveling. We don’t realize that we are now in the midst of the sixth major extinction event in the history of this planet – the last one involved the dinosaurs. Most of us haven’t fully taken in what scientists are telling us about climate change. We haven’t quite grasped that in only 200 years – a blink in geologic time – we have burned so much coal, gas and oil, and released so much heat-trapping carbon dioxide into the air, that atmospheric levels of CO2 are higher today than they’ve been for millions of years. The world is changing before our eyes – melting, flooding, acidifying, and burning in ways that no human has ever seen. If we keep extracting and burning fossil fuels at present rates, we will force the worldwide average temperatures to rise between 5 and 11 degrees Fahrenheit in this century, which would make the Earth quite inhospitable for life as it has evolved on this planet, including human life. My vision is that this diocese – and the wider Church – will come to see that caring for the Earth is the great mission of our time, and that caring for Creation must be woven into everything we do – from sermons to Sunday School, from prayers to public advocacy. We were born at an unprecedented time in human history, a time when our choices really matter to the future of our children, our children’s children, and the ongoing evolution of life. Whatever particular “issue” may be closest to our hearts – whether it be poverty and economic injustice or immigration; war, racism, violence, or human rights; education or public health – whatever you think of as “your” issue, please know that it will be deeply affected by climate change. Please keep working on those issues, but know that tackling climate change is the great and over-riding challenge that pulls us together in a common search to find a more just, peaceful, and sustainable way of inhabiting this planet. This is the kind of moment the Church was made for. This is an all-hands-on deck moment, a time when we need everyone’s wisdom and energy and help. So – to the parishes that have already invited me to preach and speak: thank you. To the parishes that haven’t yet done so: please do. I would welcome an invitation. Over the last 10 months we’ve been building a network of people in the diocese who care about Creation, and if you’re interested in joining, please give me your name and contact information. Since beginning this job, I’ve started a new Website, Reviving Creation, on which I post blog essays and sermons, and I hope you’ll take a look and maybe sign up to receive blog posts in your email. We now have a diocesan banner that says “Love God, Love your neighbor: Stop climate change,” and it has been getting a workout. Last month people from the diocese carried our banner during the People’s Climate March in New York City, which drew something like 400,000 people for the biggest climate march in history. And last Monday night, here in Springfield, a wonderfully diverse mix of poor Hispanic, African-American and immigrant communities from the inner city joined with white folks like me from places like Amherst and Northampton to march together to City Hall to ask the city to develop a climate action plan. Once again we carried our banner, and the Dean of our Cathedral was there; our Hispanic Missioner was there; members of our churches were there; and a representative of Bishop Jim Hazelwood and the New England Synod of the Evangelical Lutheran Church in America was there. Bishop Doug was one of the speakers at the rally, and that night Springfield’s City Council voted unanimously to pass a resolution to create a climate action plan. Days like that warm my heart! Here we are in the midst of our first-ever Season of Creation, and I’ve enjoyed learning about the many ways that churches in the diocese are celebrating this special season. I hope you’ll enjoy and make good use of these weeks until Christ the King Sunday at the end of November, and will lift up the sacredness of the natural world and God’s call to safeguard life. Two weeks from today we’ll be offering a special event in Worcester: on November 8, Massachusetts Interfaith Power & Light will give a Sustainable House of Worship (SHOW) workshop that can show your church how to save money and become more energy efficient and energy conserving. I hope that everyone here will make sure that someone from your church attends that event. Meanwhile I want to thank the Trustees of this diocese for carrying out a thoughtful, prayerful, and sometimes difficult discussion about the diocese’s policy and practices regarding investments in fossil fuels. I salute your decision in August to reduce our diocese’s exposure to fossil fuels and to invest instead in clean energy. I am grateful for your leadership, and I am grateful that we will have an opportunity this afternoon to discuss a resolution that asks the Episcopal Church to make the same decision. I look forward to the day when I am no longer a swinging door – the day when we all live in one space. On that day, the Church will fully understand and embody the fact that caring for the ongoing web of life is central to our moral and spiritual concern. On that day, the “secular” world will fully understand that the living mystery we call God is real, and very much alive, and is making all things new. Until that day comes, and when that day comes, I will give thanks for all of you who engage in the great work of loving God and neighbor by participating in the movement to protect life on this planet. The following resolution was submitted to the Episcopal Diocese of Western Massachusetts by the Social Justice Commission, and passed at the diocese’s annual convention on October 25, 2014. Resolved, that this 113th Convention of the Episcopal Diocese of Western Massachusetts, memorialize the 78th General Convention of the Episcopal Church to encourage all dioceses and the Consortium of Endowed Episcopal Parishes to engage within the coming year the topic of eliminating exposure to investment in fossil fuels and of reinvesting in clean energy. God calls us to be good stewards of God’s good Creation (Gen. 1:31, 2:15). Jesus commands us to care for those who are vulnerable as if we were caring for Him (Mt. 25:40). The Fifth Mark of Mission of the Anglican Communion is “To strive to safeguard the integrity of creation and sustain and renew the life of the earth.” The Episcopal Church has long been on record calling for action to address climate change, and environmental justice, most recently with resolutions in 2006 and 2009.3 The Episcopal Church, by its mission, is pledged to the protection and care of God’s people and God’s Creation. Climate change represents a titanic threat to all life, and especially to the poor. The biblical mandate and our church’s teachings could not be clearer that we must respond with faithful, prophetic action. For over two decades, the Episcopal Church and the wider faith community has utilized shareholder and legislative advocacy on climate change, to very little effect. The scientific consensus is overwhelmingly clear that anthropogenic greenhouse gas emissions from the burning of fossil fuels4 have already caused and will continue to cause climate change.5 Without a swift, concerted, global shift away from the burning of fossil fuels, the effects of climate change will displace and impoverish hundreds of millions of people in the coming century6 and condemn many species to extinction. In recent years, superstorms and droughts have plagued our planet. We witness an unprecedented melting of Greenland’s ice cap, the Arctic ice pack, Antarctic glaciers and ice shelves, and mountain glaciers worldwide. Rising, acidifying7 seas coupled with more violent storms are threatening communities at sea level worldwide. An estimated 400,000 people a year die from the effects of climate change8. A far larger number of people lose their homes, livelihoods, and health from climate-related droughts and storms, the increased spread of infectious disease due to rising temperatures, and related stressors. Climate change is, in profound ways, a matter of justice. Jesus teaches that when we care for the poor, we care for Him (Mt. 25). As the climate crisis worsens, the church must increase the scope of its response. The fossil fuel industry’s value and future depend on burning these fuels. This industry has used its financial power to prevent legislation to reduce carbon emissions, spending over $400,000 per day to lobby the US government alone.14 It secures unthinkably large government subsidies – $1.5 billion globally per day, according to the International Energy Agency. In 2013, the industry spent over $600 billion exploring for new fossil fuel reserves, far beyond the $244 billion invested globally in renewable energy.1516 This level of spending dwarfs the resources that can be mobilized by advocates for a sustainable future. Given this reality, four factors require the church to address the issue of eliminating exposure to holdings in fossil fuel companies and reinvesting in clean energy. Two of these are moral factors, and two financial. First, a growing number of religious and educational institutions are committing to eliminate their fossil fuel holdings, having concluded that it is immoral to profit from an industry whose core business creates climate change and whose financial and political influence has prevented climate change legislation. In the past, under circumstances of grave harm combined with intransigent resistance to change by the offending industry or regime, the church has debated and/or divested from certain industries (tobacco) or from certain companies which support repugnant regimes (apartheid South Africa). Such a time has arrived with the fossil fuel industry. Within the past two years, the United Church of Christ and the Unitarian Universalist Association have both voted to divest. The Presbyterian Church USA is studying divestment. The Anglican Church in Aotearoa, New Zealand and Polynesia, in May 2014, became the first Anglican body in the world to divest form fossil fuels. Union Theological Seminary and the University of Dayton, a Roman Catholic University, voted to divest in June 2014.17 The Diocese of Massachusetts has adopted a divestment resolution, and study of divestment is underway in our diocese, the Diocese of Oregon, and in hundreds of churches nationwide. The time has arrived for the Episcopal Church to take a leading role in the pre-eminent moral issue of our time. Second, analyses18 have shown that eliminating fossil fuel industries from an investment portfolio over the past twenty-five years would have resulted in no reduction in returns. This suggests that concerns about the risk to church investments posed by divestment may well be overblown. Third, a growing number of investment professionals are now warning about the inevitability of a “carbon bubble,” a term referring to the over-valuation of fossil fuel companies which currently depend on fossil fuel reserves as a substantial part of their market value. In the view of an overwhelming majority of scientists and policymakers, approximately two thirds of these reserves will not be able to be burned if the climate is to remain below two degrees Celsius. This creates the inevitability of the devaluation of these holdings; church investment managers and trustees are duty-bound to respond. The time has come to bear our witness in this new, faithful, courageous manner. For the sake of life and of justice, the time has come for the church to eliminate its holdings in fossil fuels and to reinvest in clean energy. 9. Just two examples of the effects of a warmer planet include the increased risk of hurricane disasters (see Kerry Emanuel, “Global Warming Effects on U.S. Hurricane Damage,” 2011; ftp://texmex.mit.edu/pub/emanuel/PAPERS/wcas_2011.pdf) and species extinction (“Contribution of Working Group II to the Fourth Assessment Report of the Intergovernmental Panel on Climate Change: Summary for Policy Makers,” 2007; http://www.ipcc.ch/pdf/assessment-report/ar4/wg2/ar4-wg2-spm.pdf).